The Religion in ancient Rome went through various stages throughout history. Since Rome was not a static state but continued to expand through the centuries. With this expansion, assimilation with other cultures and religious beliefs resulted in the constant evolution of ancient Roman religion. The Religion of ancient Rome had their basis in various mythologies and legendary tales and it was thought that the religion of ancient Rome began as a result of the negotiations of Numa Pompilius, the Sabine second king of Rome, with the gods. The religion was viewed as an important part of Roman identity. The priests that overlooked the matters of religious significance comprised of the elite class and there was also heavy involvement of religion in the political affairs of the empire. The founding myths, coupled with the concept of the divine destiny, played an important role in the formation of the religion of historic Rome. These founding myths are rich not just in terms of human effort but also constant intervention from the gods. The relationship of these founding myths was the belief that Rome had a semi-divine ancestor Aeneas who was a Trojan refugee and son of Venus, and it was believed that it was he who established the religion of ancient Rome. An elaborate genealogy was constructed that established the relationship between this Trojan founder and Greek influence, the legend of Rome being founded by Romulus and Remus. 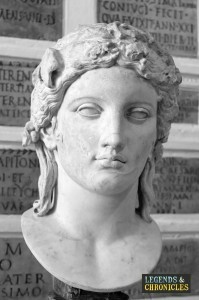 A sculpture of the head of Apollo, the god on the sun, and one of the Roman’s many gods. Prayers, vows, and oaths were central to the religion of ancient Rome, just like the religious practices of other civilisations of the time. The sacrifices and offerings for the gods were always accompanied with religious prayers and hymns. Sacrifice was considered useless without prayers and often a priest performed loud public prayers on the behalf of the community. Prayers and vows were taken so seriously that, according to Roman historian Livy, when during a Latin festival a magistrate forgot to include ‘Roman people’ among the beneficiaries during his prayer, the festival had to be started all over again. Religious oaths were sworn during important business transactions, client meetings and service, as well as during various other purposes, these prayers appealed to the sanction of the gods in addition to the witnesses. Ancient Roman religion was polytheistic and thus there were various gods that were reserved for different purposes and had different powers. Jupiter was the most powerful of all Roman gods and was central to the religious offices of Rome. During the Republic Era of Rome, Jupiter shared several characteristics with other gods such as Mars and Quirinus, who were later replaced by Juno and Minerva. With the passage of time, there was a conceptual tendency towards triads, one famous one being the plebeian triad of Ceres, Liber, and Libera. Deities were generally linked through marriages in various religious mythologies. Some other famous Roman gods and deities included Apollo, Diana, Vesta, Neptune, Vulcan, and others. Many of these gods were actually adopted from ancient Greek religion which had a considerable influence over the Roman religion. Religious practises in Rome were naturally accompanied by various holidays and festivals and it is estimated that there were over forty annual religious festivals. These festivals were of varying durations with some lasting several days while other spanning over a single day. Some of the most famous festivals of religion of ancient Rome included the festival held at Palestrina to honour Fortuna Primigenia during Compitalia, and the festival of Ludi Romani in honour of Liber. Other than religious prayers, vows, and ceremonies, various games were also an essential feature of these festivals. The origin of most of these festivals of religion of ancient Rome remained obscure even in their own time and this provided an opportunity to mythologise about them. Sacrifices of animals were common in ancient Rome and there is also evidence of some human sacrifices, although the latter was quite rare. Mostly domesticated animals such as cattle, sheep, and dogs were used for sacrifice and the best in the herd was chosen for the purpose. Different kinds of animals were sacrificed for different kinds of gods depending on their particular powers and functions. 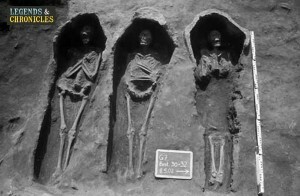 A ancient Roman burial ground. Personal virtues and divine will were both considered essential for military victories and thus religion played an important role in the military life of ancient Rome. Lack of personal virtue and negligence of religious piety was thought to result in divine wrath in the form of military defeat. It was common for Roman commanders to offers vows to be fulfilled after a military success in addition to vows for expiation after a defeat. Religious rituals were also carried out in Roman military camps and various religious offerings and rituals were performed before a battle. Roman military life and the religion of ancient Rome were intimately linked in the Roman Empire. There was not a single, uniform concept of afterlife throughout Rome and the elite classes generally adopted the philosophy of afterlife which suited them. However, the view that was common among most of these philosophies was the proper care of dead people and the concept that they remained alive in some kind of afterlife. Elaborate funeral offerings were part of the religious tradition. During the early days of the Roman society, spectacular funerals were common but with the passage of time, less attention was paid on funerals and more on the endowments to the community in the name of the dead. As expected, the funerals and burial ceremonies varied with the status and wealth of the people. During the later imperial era, when the influence of Christianity was increasing, the burial practices of Christian ad non-Christian beliefs often overlapped. The religion practises in ancient Rome were an integral part of overall Roman identity and had central importance in Roman life. Just like other ancient religions, its origins were enshrouded in mythology and various legends were used to link the religion of ancient Rome with the founders of Rome. Ancient Roman religion was heavily influenced by the Greek religious practises and even some of the most famous gods were adopted from the Greek religion. Prayers and vows were essential in the religion of ancient Rome while religious oaths were undertaken when there were matters of importance that needed to be decided. When Christianity became the official religion of the Empire, the beliefs of the Rome significantly overlapped with Christian beliefs.